The northern Rocky Mountains of Montana play host to a two-million-acre wonderland, where wildlife, outdoor recreation and immense areas untouched by development are waiting for RV travelers to enjoy. Flathead National Forest, just south of the Canadian border and adjacent to Glacier National Park, invites visitors to discover how the West once looked to America’s early inhabitants. Whether it’s taking the kids on a hike to a scenic overlook, quietly sketching the mountains surrounding a pristine lake or taking to the water on remote lakes or rivers, you’ll find a special place to do it while you’re there. Use our guide to three ways to enjoy Flathead National Forest to seed your own dreams of a Montana RV vacation. Once you’ve chosen one of the many campgrounds in Flathead National Forest as your home base, take to the trails to see why this wilderness is treasured by hikers. More than twenty-two-hundred miles of trails crisscross the national forest, so there’s no shortage of ways to explore on foot. Holland Lake & Falls Trail is a little over three miles long roundtrip and leads along a bright, blue mountain lake surrounded by dense forest. The waterfall on this trail makes for great vacation photos and the terrain is gentle enough to take young hikers. Numerous small lakes sparkle throughout the Jewel Basin Area of the national forest near Kalispell. Follow one or several of the marked trails, including one of moderate difficulty that climbs to the summit of Mt Aeneas, for breathtaking views and primo picnicking spots. Hike (or mountain bike!) at least a section of the Whitefish Divide-Smokey Range National Recreation Trail for wilderness at its best. You’ll find the trail north of Whitefish, MT in a rugged, unspoiled region filled with wildlife and views that go on for miles. The Forest Service website offers maps and tips for discovering trails of varying difficulty throughout the Flathead region. Your bonus—with campgrounds scattered throughout the national forest, you’ll come off a long day of hiking to RV luxury. Another popular way to enjoy outdoor recreation while RV camping at Flathead National Forest is to explore its lakes and rivers. Boaters, in particular, will want to camp at Hungry Horse Reservoir Recreation Area. Lakeside campgrounds ring this thirty-five mile lake below Hungry Horse Dam on the South Fork Flathead River, making it easy to camp and boat from several vantage points. If you prefer to explore wilderness waterways by kayak, raft or canoe, the North, Middle and South Forks of the Wild and Scenic Flathead River offer nearly unlimited adventure. Bring your own watercraft or take a guided tour with an area outfitter, either way you’ll have a water expedition worth remembering on these unspoiled waterways. The ability to set out on nearly any national forest road or the highways that connect Flathead National Forest to Glacier National Park and be assured of wondrous views is a third reason RV travelers come to western Montana. A particular favorite is the Seeley-Swan scenic drive (Hwy 83) from Seeley Lake to Swan Lake along the western edge of the Bob Marshall Wilderness section of the national forest. Jagged peaks, mountain lakes, wildlife and easy access to hiking trails make this drive something you simply must experience for yourself while RV camping in Montana. If you’re ready for an RV journey to a place where nature reigns supreme, your next camping trip should be to Montana’s Flathead National Forest. 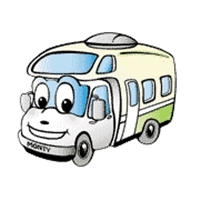 Rent an RV or pack up the one in your driveway and get going! It’s high time to visit this Rocky Mountain wilderness and see what all the excitement is about. This entry was posted in Montana RV Camping Vacation. Bookmark the permalink.